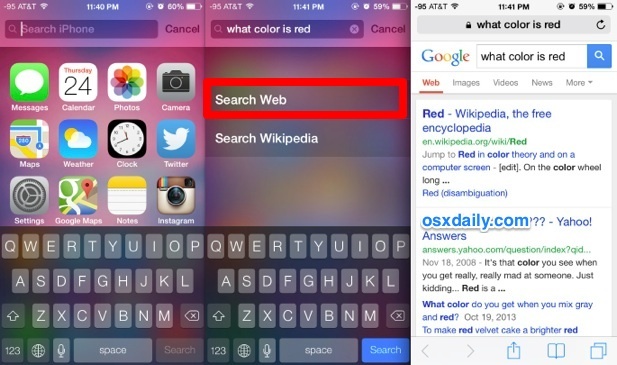 Want to quickly search the web or Wikipedia from the Home Screen of iOS? Just turn to Spotlight, the built-in search engine. Sure, the Spotlight search is often used as an application launcher or a way to quickly find old emails, notes, and contacts in iOS too, but you can also type more generic queries into it the same search box to immediately search either the web or Wikipedia for those terms. Tapping on a result from wikipedia or the web will open the Safari web browser on iPhone or iPad to complete the return of the search query. You’ll notice that search queries that match phrases or things currently stored on the iPhone or iPad will provide the local device items first, so to search the web for something more generic like “Phone” or “email” you would need to enter those phrases into Spotlight, then swipe down to scroll to the bottom of the Spotlight results and choose the “Search the web” option from there. 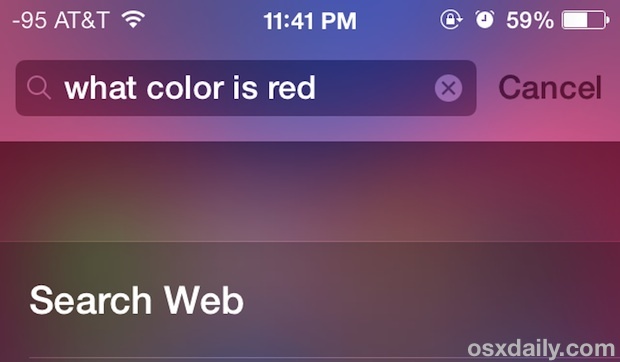 Queries and phrases that do not match anything stored on the iOS device will immediately show the two external Web and Wikipedia search options. The search engine used by Spotlight and passed to Safari is the same that is set in your default search settings. That’s usually Google by default, but you can also select Yahoo or Bing if you’d prefer either of those by going to Settings > Safari > General > Search Engine. You can not change the web browser from Safari, however. You’ll notice that Wikipedia Search won’t always turn up a unique document for each term, and may find various listings with the term nicluded instead. Using the on-page search trick for Safari can quickly help narrow down what you’re looking for in those situations. This feature was around in previous versions of iOS, briefly disappeared from iOS 7.0 to 7.0.2, and reappeared again from 7.0.3 onward. If you don’t find the option on your iPhone, iPad, or iPod touch, you probably just need to update to the latest version of iOS.